Hemp seed oil is another versatile and valuable product sourced from the industrial hemp plant. In this guide we’ll look at what it is, how it’s made and clear up some misconceptions concerning some of its qualities. There’s a fair bit of confusion over this product as it’s sometimes called “hemp oil”, which is often associated with medicinal products such as CBD or cannabis oil. 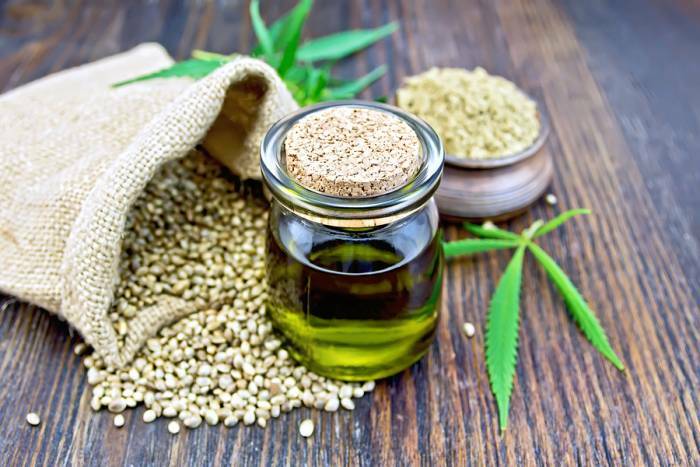 While technically (and perhaps legally) it can be referred to as hemp oil; some vendors deliberately gear their marketing to take advantage of the confusion between products – and they are very, very different in nature and price. At its most basic, hemp oil is extracted by cold pressing hemp seeds; which contain around 30% oil. It’s a far less complex and cheaper process compared to extracting cannabis/CBD oil as you can see in this video. The byproduct of extraction is known as hemp seed cake and rather than being waste, it’s valuable in itself. It contains a high amount of protein, plus retains some oil. It’s most commonly used as a high quality animal feed. After the cold pressing process, the liquid is filtered to remove sediment. The finished product is light to dark green with a nutty/grassy type flavor. When further refined, it becomes a lighter, golden colour. Refined hemp seed oil goes through processes such as bleaching and deodorising and is used for non-food purposes. Does Hemp Seed Oil Contain THC/CBD? No – because hemp oil is made from the seed, it has next to no tetrahydrocannabinol (THC) or cannabidiol (CBD), so it has no medicinal qualities related to these compounds. If the latter is what you are wanting, it’s very important to read the label of the product to determine if it is in fact hemp seed rather than cannabis oil. It’s primarily used for food; particularly in recipes where olive oil is called for. While it can be utilised in cooking, it has a low flash point and will start to smoke at around 165°C – slightly higher than extra virgin olive oil, but substantially lower than canola. As such, it’s not suitable for deep frying, but can be used for sautéing. While hemp seed oil doesn’t contain beneficial quantities of cannabidiol, it certainly has other health benefits. A good quality oil, it is rich in essential fatty acids that are important for good cardiac health. In fact, it contains greater amounts of some of these essential fatty acids (EFA’s) than olive oil. It also has a low n6/n3 (omega-6 to omega-3) ratio. The ideal ratio of omega-6 to omega-3 is somewhere between 1:1 and 4:1 – and hemp seed oil sits within this range. As essential fatty acids cannot be produced by the human body, they need to come from diet; so hemp seed can be a good way to source EFA’s. All sorts of health claims are made and while some have scientific backing, such as a dietary hempseed oil improving clinical symptoms of atopic dermatitis, others including being a cure for cancer are very questionable and should be treated with a healthy degree of skepticism. While it’s probably one of the better oils from a nutrition and health perspective, your mileage may vary in terms of positive health effects. That it tastes good and is good for you is reason enough to buy it, but don’t get caught up in the hype – and as with everything, use in moderation. Firstly, be very wary of any hemp seed oil vendor that makes the same sorts of claims ascribed to CBD oil. This is an initial signal that the product itself may be on the dodgy side. If a company is willing to mislead about attributes, they may also skimp on product quality. Try to avoid buying hemp seed oil that is packaged in plastic, as it is more susceptible to accelerated degradation. Tinted or dark glass bottle packagin offers protection from the harmful effects of light. Look for products with a batch date rather than just a best before date as the view of how long a product may stay good for may vary manufacturer to manufacturer. The colour of the oil should be a light to dark green. The difference in how green isn’t an indicator of quality – that’s more to do with the level of chlorophyll. However, if the oil golden in colour, avoid it if you intend to use it for food purposes as this is likely a refined product that lacks many of the nutritional (and taste) benefits – or it may be another type of oil altogether. Bear in mind that hempseed oil has a shorter shelf life than other oils; approximately 12 months unopened, so this is where the presence of a batch date on the label is important. As mentioned, the oil should be stored in tinted/dark glass bottle. It’s best to refrigerate the bottle of oil after opening and use within six months or at the very least store in a cool, dark place.